This post is part of our Virtual Engagement Party. This top was sent to ABOAB for review. We got married and a few weeks later, I had to RSVP to my friend's wedding. And it was one of those RSVP cards that already had the "M" there for you. Pete wasn't able to make it with me, so I was bringing my mom as my guest. So of course, my name went first. Obviously, it's Lisa. And I didn't change my last name. So I know my name. But what I wasn't sure about was the salutation. For the sake of this story, pretend my maiden (and current) last name is Smith. And we'll pretend Pete's last name is Jones. So Mrs. Jones, that's Pete's mom. And Mrs. Smith, that's my mom. But who was I? According to the Google search I did, it's actually that I'm Ms., which means any Mr. and Mrs. stuff we got is technically incorrect. 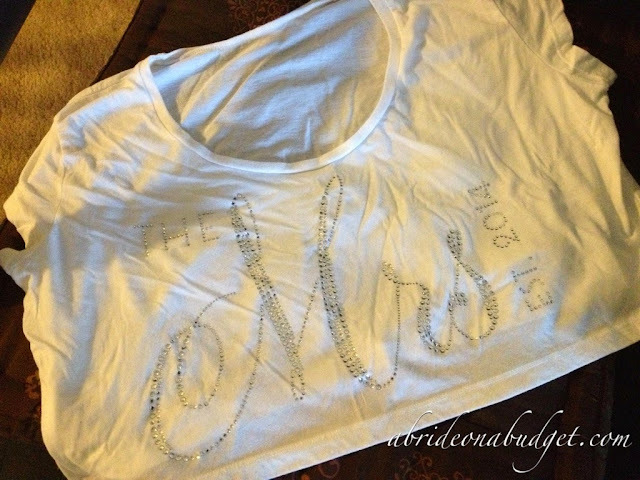 Like this awesome The Mrs. crop top from The House of Bachelorette. It was sent to me before I even thought about this whole salutation thing. Doesn't mean I'm gonna stop wearing this top because I'm already in love with it. This Mrs. crop top looked large when I unfolded it. And it's one size fits all (although, if we're being honest, there's only one size of a person who is wearing a crop top). The shirt is really soft and fits me well, although it's a little bit baggy, so I kept pulling it so the majority of it hung in the back. You could probably style it off one shoulder and pull extra fabric that way to make it fit the way you want too (assuming you're okay with the one shoulder style of the '80s that are making a comeback). What's super fun about the very sheer top is that you can customize it with the year. "The Mrs. Est." is spelled out with rhinestones and that's set. But you can change the year to whatever year you (or the bride) is getting married. Right now, you can pick from 2014, 2015, or 2016. Plus, it's white. I think anything bridal should be white. This is perfect to pack for your honeymoon. You can throw it on top of a bathing suit and wear this to head out to relax and lounge at the resort's pool. Sounds perfect to me. Plus, throwing this over a wet bikini top at the end of the day will allow the suit to pop through, and that's my favorite post-beach look. There are a ton of items you can buy at The House Of Bachelorette. You can pick up bridal sashes, tumblers, boas ... and the "risque" bachelorette party items (the ones that show up at bachelorette parties but not in photos on Facebook). BRIDAL BABBLE: Check out The House Of Bachelorette and let me know what your favorite item sold by the site is. My favorite thing is the TEXAS bride sash! I have never seen that anywhere! Favorite item is tiaras. Girls gotta wear a tiara!